I’ve got SUCH a special treat for you today, friends! My dear, sweet friend Jordan – whom I’ve known since high school – is sharing here on the blog today! Jordan and I became close friends in college and she was my matron of honor at my wedding! I admire her for her gentle spirit, her desire to serve the Lord in all she does, and most recently, her beautiful mother heart! When she and I get together, we can spend hours laughing, sharing stories, and talking about life! Jordan and her husband welcomed their first baby girl in September. Jordan has also written about creating a baby registry, establishing routines and hope for midnight mamas, and fighting anxiety with God’s truth. Today you’ll get to hear her thoughtful perspective and advice regarding capsule wardrobes! I jumped onto the capsule wardrobe train around two years ago. I had an exploding closet and “nothing to wear!” It was a major problem. My trouble came in that I was trying to copy some beautiful, very trendy women and their style, and I found myself more discontent than when I started, ironically longing for a larger closet when I set out to make it smaller. 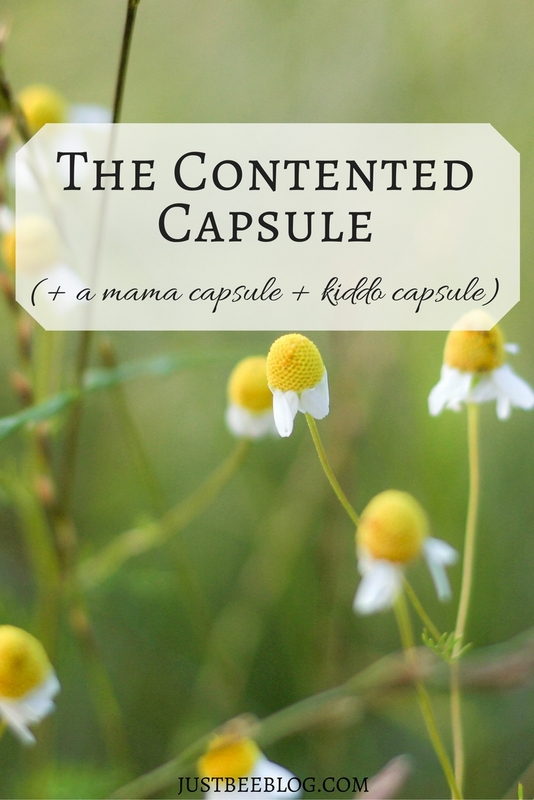 Finally, after capsuling and “re-capsuling” several times, I figured out a few important concepts I needed to keep in mind to create a capsule that worked for my life. I was never going to succeed at creating a smaller, more succinct wardrobe if I didn’t deal with the woman in the mirror first (she’s always making everything so difficult!). The root of my wardrobe woes is never the actual articles of clothing, it is always my heart. This has been a difficult one for me. I’m still praying, repenting, and seeking to be thankful for what God has given me, not for what I wish I had. Ma Wilder from “Little House on the Prairie” has become my muse (she and Joanna Gaines, but that’s another story). Think about it: the woman owned, what, four dresses? And she was just fine. More is not better. More is just more. This season’s “must have” is next season’s “garage sale fodder.” There’s so much wisdom in contentedness. It’s WAY easier to create a capsule if you have a basic color scheme to work with. I recommend picking 2 complementary bases (I picked navy and white … and black because I break my own rules, and COME ON black goes with pretty much everything), 1 accent neutral (something that will go with everything), and 1 or 2 “pop” colors per season (warm & cold seasons). I should note that I choose colors by “family.” So, if navy blue is in, so is a lighter blue. They still seem to mix and match together well! Because I wanted to dramatically decrease the items in my closet, I found that I couldn’t have a lot of “fluff,” even if it’s something I “should” have. Each item needed to be a workhorse. One of my favorite ways to get more miles out of a basic is to look for items that offer “shy” details that set them apart. A few sweet buttons down the back, or a pleat between the shoulders (like my favorite BRASS tees) goes a long way to make a basic white t-shirt or tank a love-to-wear item. I’m addicted to sales. It’s so easy for me to see something cute and versatile and rush to the register with it. Suddenly, my closet is full of “versatile items”… that I hardly ever wear. An easy way to curb this tendency is to insist that, for every item you add to your closet, one item must be donated (if it’s still in good shape) or up-cycled (if it’s not). It’s easy to get gung-ho and purge your closet without thinking about an unexpected someone: your spouse! On one of my last “donation hunts,” I tossed a long-sleeve tee that didn’t really mix and match well, and a flowery skirt, among other things. Alex came home from work, saw the donation bags, and came into the room with the cutest sad face, clutching the skirt and the tee. See, he really liked those two items. He thought they looked nice on me. So, guess what? I kept them. Call me a sucker, but he’s just too sweet and wonderful to turn down. So, ask your spouse if there is anything that they really love. It’s always nice to be considerate. With all that said, here’s my handy stay-at-home mama capsule template. Below, I also included my kiddo-capsule template! Do you have a capsule wardrobe (or would you like to curate one)? How do you cultivate contentment in your wardrobe?